Sunday’s ride took me down the hill to meet N. for some work. We’re co-teaching a class, which I’ve never done before and now want to do all and every time, and we’ve got our students putting together short pieces for the radio. The students are doing all the work–the research, the writing, the interviewing, the recording–and on Sunday our job was to go to the places they’ll be talking about to gather some ambient noise to add to their pieces. I locked my bike up in Mount Vernon and we gathered the recording equipment and headed out on foot. I don’t walk all that much, and every time I do I realize what a different view you get from this pace. That was more pronounced as we lingered outside places, microphone up in the air, listening for what Baltimore’s old Chinatown “sounds” like. I snapped this picture as we waited for noise. These buildings at Park and Mulberry are run down, boarded up, and if it weren’t for the hints of old decorative architecture and the faded Chinese characters on the building, you might not know there was once a thriving ethnic neighborhood here. On a bike I might not have noticed the pair of jeans hanging out the top window or the subtle fades of red paint from building to building. What I really noticed, though, was how standing there expressly to listen changed what I saw. There was the jingle of the bells hooked to the door of the Chinese grocery, the flap-flap-flap as the shopkeeper beat out the store’s mat, the whoosh of the occasional car up Park Avenue, and the quiet of this part of town. It was much less quiet down by Camden Yards where we listened to the light rail beep and brrring and choochoochoo through the busy intersection. There wasn’t much else to hear over the din of the train. Over by Our Daily Bread it was all traffic headed to I83, the occasional low thrum of a car radio stopped at a red light and the whistle of seagulls looking to pick up the scraps left behind by people with no choice but to eat outside in the cold. We stood on that corner for several minutes, just listening, and I was struck by how much the soundscape is dominated by cars. They are an overwhelming presence, and everything seems to be built around their accommodation. The streets down here used to be filled with streetcars, and I wonder how noisy that was. And then I though about places that are designed expressly to slow traffic, which means they also have many fewer cars. 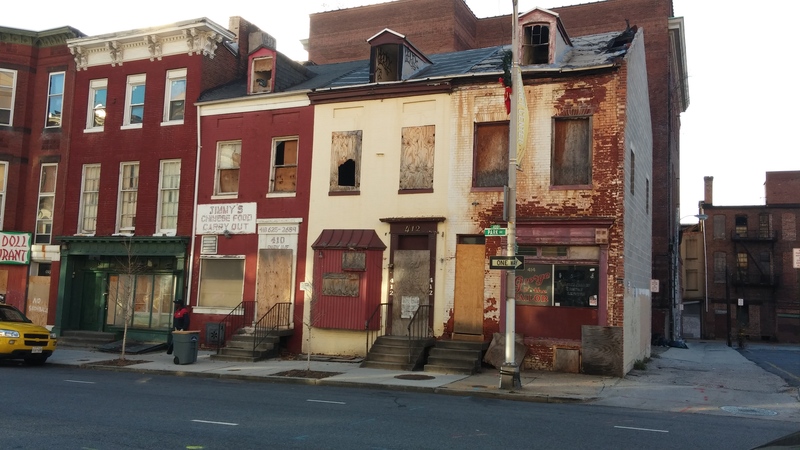 What do they hear that the people trapped on this East Baltimore corner by poverty and the prison industrial complex don’t hear? This traffic and these carceral institutions are what make this city work, and they’ve all been hidden over here, away from the folks over there. We listened, and then we crossed the street and made our way back to Mount Vernon before I got on my bike and headed back up the hill to Waverly, happy to have been reminded again what is made visible by a shift in attention. This entry was posted in blight, neighborhoods and tagged Baltimore, blight, Chinatown, Downtown, East Baltimore, soundscapes, walking. Bookmark the permalink. Wonderful observations! Thanks for this good reminder of a new way to focus my day today.